Spelling of Field: Field is spelled f-i-e-l-d. Definition of Field: A field is an open area of land free of woods and buildings. There are a variety of types of fields, each dedicated to different activities or purposes. Field may also refer to the area or division of an activity, subject, or profession, or to the location in which a specific type of work is completed for a particular industry. A field is also a region or space in which a particular effect exists, such as a magnetic field. As a verb, field means the act of taking care of or responding to something, such as a request; providing an impromptu answer or solution to something; and, to catch or pick up (something) and, usually, throw to a team member. Pronunciation of Field: Field is pronounced feeld. What does field mean? Field can function as a verb, adjective, and noun. Most commonly, field functions as a noun referring to a cleared area of land, or an area of land with a specific use, such as a soccer field, or to a specific area of study or work, similar to an industry. It was a serene image of cows and horses grazing out in the field. Her dream is to be a leading researcher in the field of medicine. 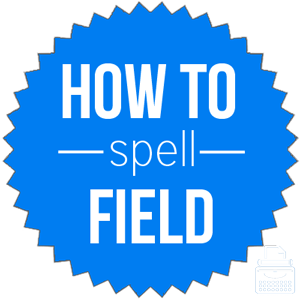 As an adjective, field describes anything relating to any kind of field. The soldier was temporary pulled away from field operations to deal with a family emergency. While she was away doing field work, her daughter gave birth to her first grandson. Finally, the verb is used much less commonly. As a verb, field can involve catching or stopping and throwing something, such as a ball, or dealing with or responding to something, such as a question or request. The first baseman fielded the ground ball. My secretary will field all requests for more information. From the field: (in football) in field goals as opposed to free throws. Take to the field: to begin or resume an activity, such as a sport or military operation. In the field: in actual use or application; away from the office, lab, or workshop. Play the field: to vary one’s activities; to date more than one person. Field was first used in the 12th century, according to Merriam-Webster’s. Field comes from Middle English via Old English feld, which is related to Old High German feld, meaning field. Field can function as a noun, verb, and an adjective. It is most commonly used as a noun referring to a clearing of land without trees or buildings and having a specific purpose, or, to a specific area of study or work.